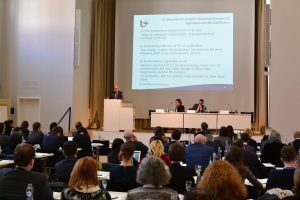 Last weekend, more than a hundred scholars of private international law followed the invitation of Jürgen Basedow, Jan von Hein, Eva-Maria Kieninger, and Giesela Rühl to discuss the ‘Europeanness’ of European private international law. Despite the adverse weather conditions, only a small number of participants from the UK – whose presence was missed all the more dearly – were unable to make it to Berlin. Thus, the Goethe-Saal of the Max Planck Society’s Harnack House was packed, and so was the conference programme, which spanned over two full days. It was kicked off by Andreas Stein (European Commission) and Johannes Christian Wichard (German Ministry of Justice), who underlined both the accomplishments of and the challenges for European private international law in their respective welcome addresses. The programme then proceeded from a closer look at the sources of European private international law (and their relationship with other international instruments and the domestic laws of the member states) to an analysis of its application in the courts of the member states (including the ascertainment of foreign law) to a discussion of the ‘Europeanness’ of academic discourse and legal education within the EU and outside of it (with a focus on the political dimension of EU private international law). All presentations provided ample food for thought, as was evidenced by the lively discussions that followed each panel. They highlighted a number of interesting tendencies, such as the remaining ‘piecemeal character’ of the field, the ambiguities caused by an ever-increasing number of recitals in European instruments, the regrettable absence of private international law from the legal curriculum in many EU member states, and a certain convergence of academic styles, not least through the growing adoption of German-style commentaries and the emergence of English as the undisputed lingua franca of the field. One of the more contentious issues discussed was the possible creation of a general instrument of private international law (think: Rome 0 Regulation), or even a complete codification, with numerous participants pointing towards its potential for more coherence, clarity, and ‘teachability’ of European private international law – while others urged more caution. The most prominent theme of the two days, though, seemed to be the observation that the emergence of a distinctly European scholarship of private international law should be both welcomed and fostered. The idea of creating an association that could provide an institutional framework for further dialogue between European scholars, practitioners, and other stakeholders in private international law was mentioned more than once – and received almost unanimous support during the round table discussion that concluded the conference. It was fitting, then, that the conference included the official launch of the Encyclopedia of Private International Law, many authors of which were present in Berlin. This truly Herculean project, just as the conference itself, is testimony to how fruitful such dialogue can be.